These young, serpentine creatures are sky blue in coloration, having white fins located on the side and top of its head and at the end of its tail; this is for maneuvering. Sea Wyrms have slightly big, pale red eyes with vague markings running down their smooth-scaled bodies. They have dull teeth, but they are sharp enough to produce a strong bite on prey. Their weak gills has not developed the ability to go above the surface of water, less they suffocate for the few seconds they attempt. These Sea Wyrms swim close to its mother so that is can be protected and can observe the process of hunting. Their light blue bodies allows them to conceal itself with the waters before attacking. When not hunting, they play with other sea creatures. A mighty, serpentine creature with sturdy cerulean to dark blue scales. As they grow from a Sea Wyrm, Serpents gain three extra pairs of fins for proficient maneuvering. They have sharp and narrowed crimson eyes, the markings running down their bodies gray and more produced. Because their gills are more developed, they are capable of going through the surface of the ocean and their teeth have matured to be sharp enough to crunch through reinforced steel. Sea Serpents are active predators in the ocean, always searching for valuable prey. With increased speed and proficient maneuvering, they can attack with either a vicious crunch or a swing of their strong tail. These creatures are known to attack ships, mistaking them for prey to challenge. Enormous, serpentine creatures of the sea sporting iridescent sapphire scales and eerie black markings scrawling down its towering body. Dark blue battle-worn fins, shaped similarly to a crown, extends from its head with hefty intimidation. Three large spikes jut out from the end of its tail. It has sword-sharp teeth capable of ravaging over 20 tons of steel with ease. Its eyes are completely red, no sign of visible pupils or irises. Basilisks are relatively reserved creatures that aimlessly wanders the ocean in search of capable prey to challenge. 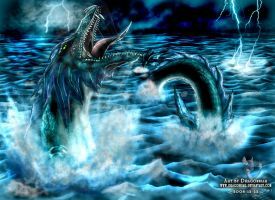 During its extended growth from a Sea Serpent, Basilisks have developed a large maw to subdue opponents better and the spikes jutting out from its tail are specific for severely staggering or crippling. Very few Basilisks exist since it takes nearly 200-250 years for a Sea Serpent to grow into one. However, if angered, whether from persistent threatening or endangerment to its children, the Basilisk is capable of devastating magical attacks and treacherous storms. The ability to take on a large group or force singlehandedly with the skill and proficiency of an entire group yourself.